Video Acceleration API (VA API) is a royalty-free API as well as its implementation as free and open-source library (libVA) distributed under the MIT License. The VA API is to be implemented by device drivers to offer end-user software, such as VLC media player or GStreamer, access to available video acceleration hardware, such as PureVideo (through the libva-vdpau driver, which implements VA API in terms of VDPAU) or Unified Video Decoder. The API enables and provides access to hardware-accelerated video processing, using hardware such as graphics processing units (GPU) to accelerate video encoding and decoding by offloading processing from the central processing unit (CPU). 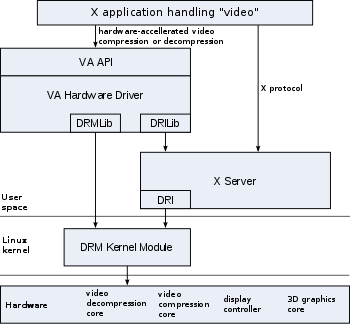 VA API video decode/encode interface is platform and window system independent but is primarily targeted at Direct Rendering Infrastructure (DRI) in X Window System on Unix-like operating systems (including Linux, FreeBSD, Solaris), and Android, however it can potentially also be used with direct framebuffer and graphics sub-systems for video output. Accelerated processing includes support for video decoding, video encoding, subpicture blending, and rendering. The VA API specification was originally designed by Intel for its GMA (Graphics Media Accelerator) series of GPU hardware with the specific purpose of eventually replacing the XvMC standard as the default Unix multi-platform equivalent of Microsoft Windows DirectX Video Acceleration (DxVA) API, but today the API is no longer limited to Intel-specific hardware or GPUs. Other hardware and manufacturers can freely use this open standard API for hardware accelerated video processing with their own hardware without paying a royalty fee. The main motivation for VA API is to enable hardware-accelerated video decode at various entry-points (VLD, IDCT, motion compensation, deblocking) for the prevailing coding standards today (MPEG-2, MPEG-4 ASP/H.263, MPEG-4 AVC/H.264, H.265/HEVC, and VC-1/WMV3). Extending XvMC was considered, but due to its original design for MPEG-2 MotionComp only, it made more sense to design an interface from scratch that can fully expose the video decode capabilities in today's GPUs. The free and open-source drivers of the integrated graphics known as "Intel HD Graphics" (Intel HD Graphics 2000/2500/3000/4000) inside Intel Core i3 / i5 / i7 Processor Family (Nehalem, Sandy Bridge, Ivy Bridge microarchitecture based) processor family. The closed source proprietary drivers for Atom E6xx and Penwell based SoCs are also supported via its Media Infrastructure Accelerator (MI-X). The closed source proprietary drivers Intel Medfield SoCs with Imagination Technologies's PowerVR (VXD375/385 and VXE250/285) based integrated graphics. The closed source proprietary drivers of S3 Graphics's Chrome 400 and later series are also supported. In November 2009, VA-API also gained a new proprietary backend named "xvba-video" which allows VA-API powered applications to take advantage of AMD Radeon's proprietary fglrx drivers for its chipsets with UVD2 support via the XvBA library (X-Video Bitstream Acceleration API designed by AMD), for closed source proprietary driver only. Additionally, VDPAU (Video Decode and Presentation API for Unix), a competing API designed by NVIDIA, can potentially also be used as a backend for the VA API. If this is supported, any software that supports VA API then also indirectly supports a subset of VDPAU. VA API currently supports these video codecs in the official mainline version, but note that exactly which video codecs are supported depends on the hardware and the driver's capabilities. The current interface is window system independent, so that it can potentially be used with graphics sub-systems other than the DRI (Direct Rendering Infrastructure) in X Window System, such as direct with framebuffer, and it can work with third-party DRM (Direct Rendering Manager) libraries. In a nutshell, it is a scheme to pass various types of data buffers from the application to the GPU for decoding or encoding a compressed bit-stream. ffmpeg, a command line tool from the FFmpeg project, supports VA-API encoding through CLI with version starting from 3.1 and also libavcodec (also part of the FFmpeg project) does contain code that other applications use to support hardware accelerated decoding, including VA API. ^ a b c "VA-API Video Acceleration On Intel Medfield - Phoronix". Phoronix.com. Retrieved 23 February 2019. ^ "Video4Linux2: Path to a Standardized Video Codec API" (PDF). Events.linuxfoundation.org. Retrieved 23 February 2019. ^ Nathan Willis (2009-07-01). "VA API slowly, but surely, making progress". Lwn.net. ^ "Mplayer, FFmpeg Gain VA-API Support - Phoronix". Phoronix.com. Retrieved 23 February 2019. ^ "vaapi". Freedesktop.org. Retrieved 23 February 2019. ^ "Intel's Poulsbo Driver A Bloody Mess? - Phoronix". Phoronix.com. Retrieved 23 February 2019. ^ "S3 Graphics Releases Linux Driver With OpenGL 3.0, VA-API - Phoronix". Phoronix.com. Retrieved 23 February 2019. ^ Michael Larabel (2009-02-03). "A NVIDIA VDPAU Back-End For Intel's VA-API". Phoronix. Retrieved 2009-03-13. ^ "Emby Server 3.0.6400 Released". Emby.media. 29 August 2016. Retrieved 23 February 2019. ^ "Mailing list entry that describes uses of VA-API". Lists.moblin.org. Retrieved 23 February 2019. ^ "Fluendo's New Codecs Support VDPAU, VA-API - Phoronix". Phoronix.com. Retrieved 23 February 2019. ^ "H.264 VA-API GPU Video Acceleration For Flash - Phoronix". Phoronix.com. Retrieved 23 February 2019. ^ "Hardware-accelerated video decoding, encoding and processing on Intel graphics through VA-API". Cgit.freedesktop.org. Retrieved 23 February 2019. ^ a b "XBMC Gets Working Intel VA-API Support - Phoronix". Phoronix.com. Retrieved 23 February 2019. ^ "Release Notes - 0.25 - MythTV Official Wiki". Mythtv.org. Retrieved 23 February 2019. ^ "VLC 1.1.0 release - VideoLAN". Videolan.org. Retrieved 23 February 2019. ^ "[Client] 2.2.6 Released – Significant CPU usage reductions included". Bluecherrydvr.com. 2 March 2017. Retrieved 23 February 2019. ^ "the xine project - News Feed". Xine-project.org. Retrieved 23 February 2019. This page was last edited on 22 March 2019, at 12:33 (UTC).